We are the leaders in manufacturing state-of-the-art Of Electrical Contractor that serve various industries in the area of efficient electrical power distribution. Our distribution modules are easy to install and use and offers multi-channel output. There is a sensitive failure alarm and a display that shows the running status of the systems. 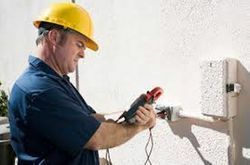 We serve the market requirements, by offering the finest array of Electrical Contractor. Tested on set parameters to ensure its proper functionality, this contractor is available in various specifications and finds its applications in several devices. The offered contractor is manufactured by skilled professionals using premium grade components with the aid of sophisticated techniques. According to the customer needs, this contractor can be availed from us at most economical rates.